Dennis Oland murder trial day #22 . Defence lawyers Alan Gold and Michael Lacy made it in from Toronto yesterday so court will sit this week. However, it appears Crown Prosecutor PJ Veniot has not been able to get here. It looks like court will proceed nonetheless with Jill Knee and Derek Weaver for the crown. Expected to testify today is SJ police Cst. David MacDonald. He worked with Sgt. Mark Smith in forensics and is the one who discovered staining on Dennis Oland’s brown jacket weeks after it had been seized during a search of Oland’s home. Knee says Veniot is attempting to make it to court from his home but will likely not be present until the afternoon. Justice Terrence Morrison sympathizes - says his own drive to SJ from Fredericton yesterday was no picnic. Knee begins by asking MacDonald about his early involvement in the investigation. He attended Richard Oland’s autopsy to assist Sgt. Smith in gathering evidence from the body - hairs, fibres, fingernail clippings etc. Then conducted examination of the body with CrimeScope - a special forensic light with multiple bandwidth settings, designed to make various compounds fluoresce. Area on shin fluoresced. Smith photographed it. MacDonald swabbed it. The following week MacDonald is designated as the officer to seize items during the search of Dennis Oland’s home and grounds. MacDonald is summoned when items of interest are discovered by officers and he takes possession of them. Seizing items involves a number of steps. MacDonald wears gloves and places items in individual evidence bags or other containers and does all of the paperwork to identify and track what has been seized. Police seize clothes, shoes, electronic gear, Oland’s car and other items. MacDonald photographs everything where it is found before seizures occur. He says the brown jacket was found hanging in a closet among numerous items and as he asked lead investigator Rick Russell what was of interest Russell put his hand on the brown coat. MacDonald says he was wearing a fresh set of latex gloves when he took the jacket and “rolled it up” into a brown paper evidence bag. When Russell touched the jacket what did he have on his hands? “He had bare hands.” Is that normal? No. 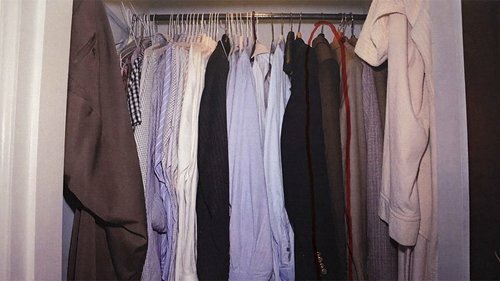 MacDonald says he also seized 7 shirts from the closet. What, if anything did Russell have on his hands when he grabbed the jacket? asks Knee. "He had bare hands," says MacDonald. Is that normal when you're going to be seizing something? she asks. No. Now on to the master bedroom. MacDonald seizes a dry cleaning receipt from a bedroom dresser. Into the master bathroom he seizes a bathroom waste basket full of refuse. 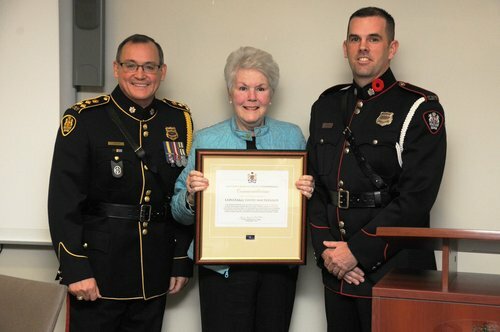 MacDonald places the jacket in storage at the police station on July 14, 2011 and does not look at it again for nearly 20 weeks. MacDonald says he placed the jacket in a paper bag when he seized it. Paper bags are used for clothing items instead of plastic bags in case there's any trace evidence that needs to dry, he says. Paper breathes. MacDonald hasn't been asked about it yet, but during Oland's first trial in 2015, he testified the bag measured about 30 cm by 30 cm. "It barely fit in there, so I just folded it up as best as I could and put it into it," he had said. 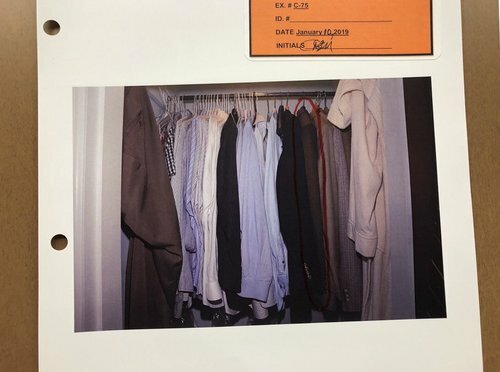 During cross-examination, the defence had argued folding it up like that could have caused different areas of the jacket to touch and evidence to transfer, but MacDonald said the jacket was a "dry exhibit." MacDonald hasn't been asked about it, yet during the first trial he said the jacket remained stored in the paper bag for about four months. He acknowledged at the time that the seizure "could have been done better." Crown prosecutor Jill Knee leads MacDonald through the chain of custody/continuity of evidence. He refers to his notes, contained in a red binder that's at least 2"-thick. He took the jacket back to the police headquarters, forensics office, fingerprint room. Sept. 3, 2011, placed in locker #28 , Nov. 29, locker # 24, Nov. 30, he took it to the RCMP forensic lab in Halifax for testing, picked it up 8 months later on July 30, 2012, placed it in locker #23 , on Sept. 4, moved to locker #3 , back to lab Oct. 26, picked it up Feb. 14, 2013. It was placed in a forensic freezer at the new police headquarters at Peel Plaza, moved to locker #2 the next day, MacDonald brought it to court on July 7, 2014 and it was entered as an exhibit for Oland's preliminary inquiry. Where was the jacket during the Saint John Police Force's move to the new headquarters? asks Knee. The RCMP lab, says MacDonald. 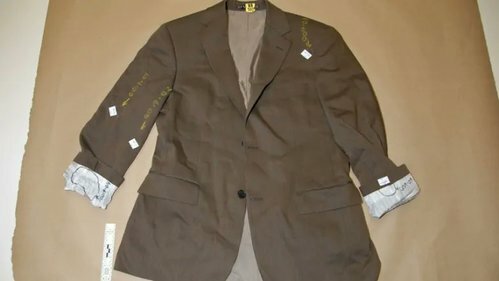 MacDonald identifies patches of cloth he cut from the brown jacket and sent to the RCMP for laboratory analysis and a BlackBerry cellphone seized from Dennis Oland during his house search. MacDonald says a search of a boat connected to Dennis Oland was also undertaken at the Royal Kennebecasis Yacht Club but it turned up no evidence.